Good Morning, It’s Granola Time | One Picture, A Million Words. What better way to start my blog than to post a picture of what I usually have for my first meal of the day – granola. The granola pictured is an adaptation of Nekisia Davis’ Olive Oil and Maple Granola, one of the Genius Recipes from Food52. 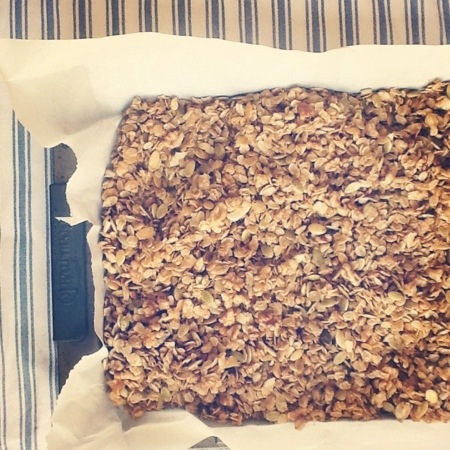 A fact of life: granola is always infinitely better when made at home. In fact, this recipe is so good that I used it to successfully wean my husband off his 30 year daily breakfast staple, Quaker brand Corn Bran Squares. Honestly, I can’t imagine how someone can eat the same thing everyday for 30 weeks let alone 30 years. It used to drive me crazy how he would prefer eating a bowl of highly processed cereal over going out for brunch! But all is good now.